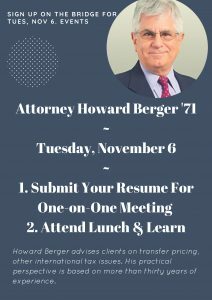 Students are encouraged to attend a lunch and learn event with Howard Berger ’71 in the Career Development Center, room 201 from 12-1 p.m. on Tuesday, November 6th. Howard will also be conducting one-on-one student meetings on Tuesday, November 6th as well. Students interested in an appointment should submit their resume and sign up for a session on The Bridge. Howard Berger, Special Counsel for Covington & Burling, advises clients on transfer pricing, other international tax issues, and tax controversy. His practical perspective is based on more than thirty years of experience. He recently served as Senior Adviser to the Director of Transfer Pricing Operations at the Internal Revenue Service, represented the IRS in examinations and before Appeals, and developed cases for litigation. Mr. Berger also was the primary U.S. representative in arbitration proceedings under U.S. tax treaties and represented the U.S. in Competent Authority negotiations. In previous service with the IRS, Mr. Berger was a principal author of U.S. transfer pricing regulations. Mr. Berger also was with the national and London offices of a Big Four accounting firm and was international tax planning director for a Fortune 500 corporation. Mr. Berger and his wife live in Bethesda, Maryland, not far from their daughters, Emily Berger, Bucknell ’04, and Annie Berger, Bucknell ’07.